or here to get the official form ya ! selamat berjaya di sana ! Good morning and I have Good News! This is Captain Jack Swallow from The TrailBlazers and I wish to thank you very much for publicizing the 3K Triple-One Hunt here. 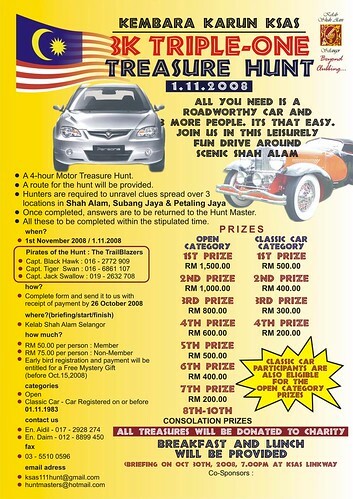 We wish to inform those who took part in the KL Motor Hunt in March this year may exercise their RM 10 discount voucher for the 3K Triple-One Hunt. Kindly write down “(KLMH Disc)” next to your name in the entry form before faxing the entry form and the bank-in-slip(with the reduced amount)together. Take the 3rd exit (Persiaran Kayangan),3.2 km after the Plaza Tol Batu Tiga. Turn right (3o’clock) at the first roundabout and do a U turn at the next roundabout.Turn left at Jalan Tenis and left again at the next traffic light. The Kelab is just ahead. Hope to catch up with some of you at the Atmah Hunt tomorrow. Pleasant day and the pirate anchors here! Take care and have Fun. thanks captain for the info !